This beautiful set by the highly sought-after Goldsmiths & Silversmiths Company is hallmarked for 1928. The cup with a scroll rim above a continuous band of engraved flower motifs, the spoon terminal with conforming decorations. Fitted in original case, with Royal blue leather exterior and dark pink velvet and cream satin interior. London Assay mark for cup. Sheffield assay mark for spoon. Date letters "n" and "l" for 1928. Height: 6 cm / 2.4 inches. Base & rim diameter: 3.5cm / 1.3 inches. This would make a very special christening present. 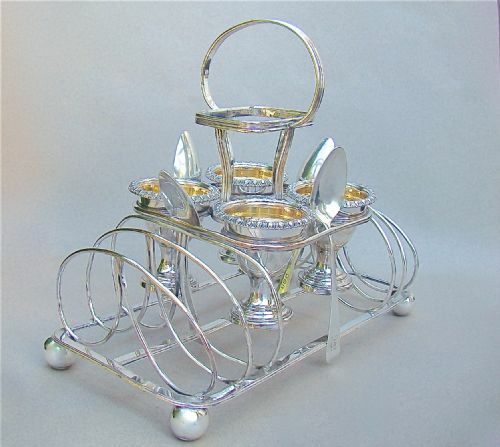 This is a rather fabulous Georgian Old Sheffield plate egg cruet set for four settings incorporating a toast rack. The removable egg cups resting in a wire-work frame toast-rack stand. The base with four ball feet, the top with a reeded carrying handle and receptacle for salt cellar, no longer present. The four egg cups with tongue and dart borders and gilt interiors. The upper part of the frame with slots for egg spoons. 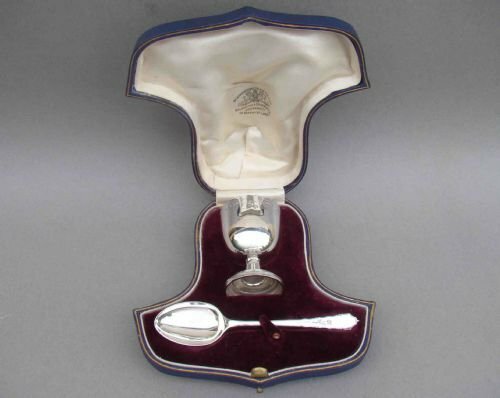 The spoons are a replacement, they are solid silver and bear the marks of Peter and William Bateman and are dated London 1807. PB over WB for Peter and William Bateman. Date letter "M" for 1807. Height at highest: 19cm / 7 inches. Width at widest: 12.5cm / 5 inches. 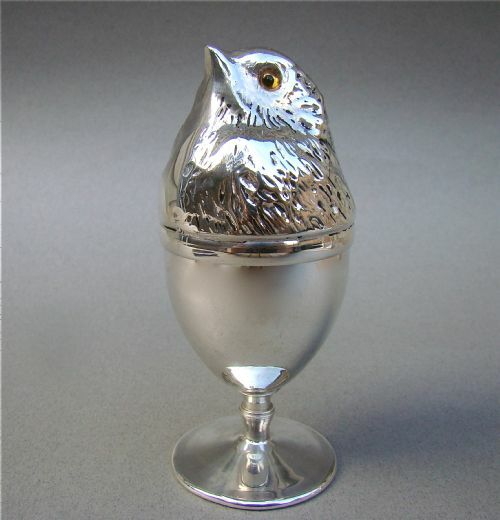 This is a truly delightful silver plated egg cup modelled as a chick. 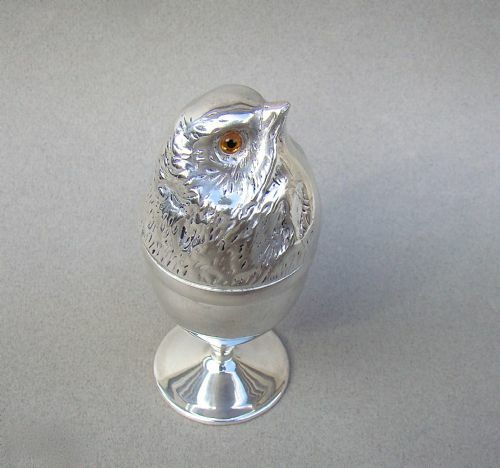 The plain base fitted with a pull-off cover modelled as a chick with textured plumage and yellow glass eyes. Diameter of rim: 4cm / 1.4 inches. Diameter of rim: 4.5cm / 1.6 inches.